My name is Mel England and I am a Freelance Professional Makeup Artist covering the Harrogate and North Yorkshire area. It can be quite tricky to find the right foundation to suit all your needs… one that has the right amount of coverage and crucially is the correct colour. But there are a few other things to consider too. The answer to this question will determine whether you go for a matte or dewy foundation. If you tend to have a shiny forehead and nose, then you may well be oily/combination, in which case it’s best to go for a matte foundation such as Estee Lauder’s Double Wear Foundation. If you tend to have slightly drier skin then it’s best to choose a dewy foundation such as Bourjois Healthy Mix Serum Foundation. It might not always be obvious whether you have a cool or warm undertone. One of the best ways to decide is to think about how well your skin tans. If you don’t tan easily and you burn if you’re not careful then you most likely have a cool (pink) undertone. However if you tan well and rarely burn you most probably have a warm (yellow) undertone. Do you have any blemishes or pigmentation / age spots? 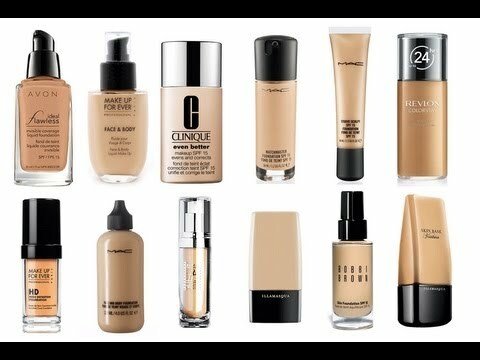 If you have any of the above then you have an uneven skin tone you will probably want to choose a fuller coverage foundation. However I would suggest you resist from applying too heavy a foundation and instead use a heavy duty concealer such as Vichy Dermablend’s Corrective Foundation to cover up any stubborn blemishes or marks. If you have a clear complexion stick to a tinted moisturiser such as Laura Mercier’s Award Winning Tinted Moisturiser. Question: How do I choose the right colour foundation? Don’t test the colour on your hand! The chin is the best place as it is inbetween your face and neck. If the foundation disappears into your skin, it’s the perfect colour! If not, it may be too dark, too light or the wrong undertone, so be patient and try a few more. If you have the correct colour you won’t get the dreaded tide mark around the jawline. TOP TIP: Buy 2 foundations two shades apart (for example buy Bourjois Healthy Mix Serum in 51 & 53 and mix together to create 52) so that you have the right shades for your skin throughout the different seasons of the year. Question: Should I apply foundation with a brush or my fingers? Honestly, either are fine although as a Professional Makeup Artist I do tend to use brushes when working on clients. If you are using your fingers just make sure you really do blend well and pat the foundation well into the skin. If you are new to buying brushes, start with something like the No. 7 Foundation Brush which is great value and a lovely shape. Question: Where do I apply foundation? Think about where you need the most coverage (it’s usually around the nose area where there tends to be some redness) and start there. Then blend outwards so that by the time you get to the jaw and hariline there should be hardly any foundation left. Finally for a flawless finish, either gently sweep over a little powder such as Ariane Poole’s Invisible Blotting Powder. Or apply a little bit of highlighter on the top of the cheekbones, such as Becca’s Shimmering Skin Perfector for a luminous finish. I hope that’s helped you feel more confident in future when choosing your next foundation! For lots more Makeup Tips, check out my Blog.